Ventipop Blog First Things First...20 Things About First Things / Venti Shots #138 Become a Patron! No matter how cool or original you think you are (and I'm not just talking to you, Millennials), someone, somewhere has already been there, done that. In the immortal words of Christian Slater in the so cheesy yet so underrated 1990 movie Pump Up The Volume, "all the good themes have been used...turned into theme parks." 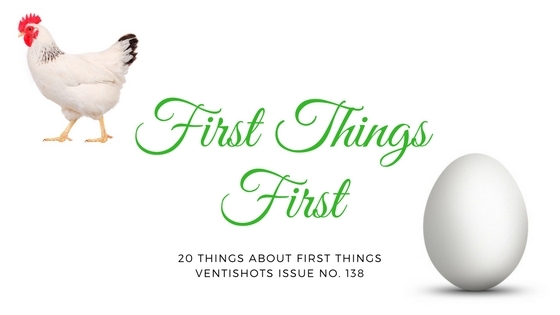 In this edition of Venti Shots, I sought out 20 things about First things. Enjoy the read and please be the first one to tell your friends they should check out Ventipop. Sign up with your email address to receive an update when I post. Long live the Queen - For the first time ever, a woman led the changing of the guard at Buckingham Palace. Glows in the dark, eh? - Canada recently released its first glow in the dark coin into circulation. Cockfosters, Shepherd's Bush, Piccadilly Circus? - How England's tube stations first got their unusual names. Tennis Anyone? - On October 18, 1958 visitors to the Brookhaven National Laboratory in New York played the first video game. She's The First - 100% of your donations to our scholarship fund supports girls in low-income countries who will be the first in their families to graduate high school. Give me some credit - How a forgotten wallet led to the first modern day credit card. The Golden ATM - The world's first ATM turns to gold on its 50th birthday. "Peculiar in that which is good" - Oberlin college in Ohio was the first school to accept not only women as well as men, in 1837, but black students as well as white, in 1835. Picture This - 20 First Photos from the History of Photography. A Good First Impression - Want people to like you? Ask questions. Holy Shipworm - For the first time ever, a sulphur-powered sea-dwelling giant shipworm has been found in the Philippines. First in Flight - Who was the first American President to fly on Air Force One? Vibrato - The first service to transform your favorite song into unique wall art. No Dumbo Drainer - Friendly companion first design created a cutlery/toothbrush holder that drains excess water directly into the sink. Introducing Spire - The first fitness tracker for your mind. The New Dating Game - Hinge is the first popular dating app to add video. Flirting from Afar - TInder was not the first to make flirting a distance game. Nightclub goers in 1920's Berlin didn't grab a smartphone to flirt with a stranger across the room. They grabbed pneumatic tubes.